(Photo: Ecumenical News / Peter Kenny)ACT Alliance general secretary John Nduna prepares a speech during the World Council of Churches 10th Assembly in Busan, South Korea on November 5, 2013. 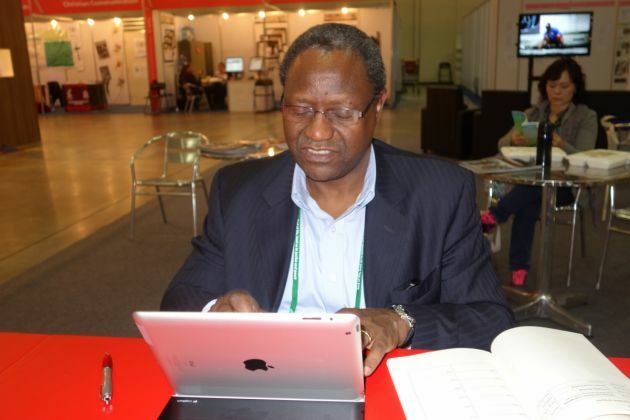 The ACT Alliance general secretary, John Nduna shared his concern that the threat of climate change is increasing Wednesday during a press conference at the World Council of Churches 10th Assembly in Busan, South Korea. "We are very concerned at the low level of political ambition we have seen from all governments to date. This must change – otherwise, we risk an irreversible climate catastrophe," said Nduna, a Zambian lawyer. The ACT Alliance is a collaboration of more than 140 churches and organizations that work together in 140 countries to create change in the lives of the poor and marginalized people. Combined, there are about 25,000 people who work in humanitarian aid and in the development and advocacy. The ACT Alliance and various churches are very concerned in regard to the incredibly low action by governments and the international community. "In September this year, the intergovernmental panel on climate change, IPCC, released a report establishing that the connection between human activity and climate change is clearer than ever before," Nduna said. Nduna explained what the ACT Alliance is striving for saying, "COP 19 [the global climate talks] must establish an international mechanism to address the issue of forced migration as a result of communities losing their land and territories, and governments must commit to reducing greenhouse gas emissions by the required amount to keep global warming to below 2 degrees Centigrade," Nduna said. He explained how there is a need for every church or church organization to continue promoting and advocating climate change in their work. The Zambian emergency aid chief also asserted the need to push governments to see beyond their own national interests, as well as providing financial support for the poor and most vulnerable.